Yemen's ex-president Ali Abdullah Saleh said in an interview broadcast Friday he had rejected "millions of dollars" Saudi Arabia offered him if he stood up to the Shia rebels. 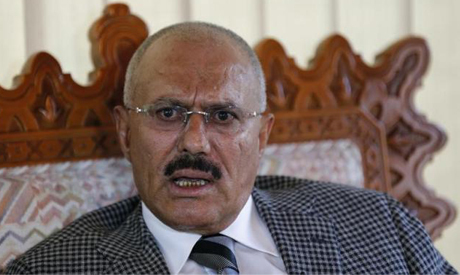 "They told us 'we'll pay you millions of dollars if you ally with us'" against the Houthis, Saleh told the Beirut-based Al-Mayadeen television channel, adding that he rejected the offer. "We will not let go of the Houthis," he said. He said the former Saudi ambassador in Yemen "came to me with a message from the kingdom asking me to stand by (fugitive President Abedrabbo Mansour) Hadi and the Muslim Brotherhood... against the Houthis." "I told them I support national unity for all political forces in Yemen," he said. "Our difference with the Houthis... was administrative, not ideological," he said, speaking of his regime's nine wars with the rebels in their northern regions. He accused the Sunni-ruled kingdom of seeking to sow "sedition" in Yemen, and said its "hatred" for the Houthis was "sectarian". But "sooner or later we will hold talks with Saudi Arabia," he said. Saleh himself belongs to the Iran-backed Houthis' Zaidi offshoot of Shia Islam. The interview took place in the rebel-held capital Sanaa. Saleh accused Hadi, who sought refuge in Riyadh after rebels closed down on his last southern refuge, Aden, of having "left power to the Houthis and fled". "Abedrabbo Mansour is over," he said. Saudi-led coalition warplanes launched an air campaign against the Houthis and forces allied to Saleh in Yemen on March 26. In the interview, he renewed calls for talks in Geneva between the Yemeni parties, as well as negotiations between Yemenis and Saudi Arabia. The United Nations is trying to reschedule postponed peace talks in Geneva between Yemeni political forces. Saleh said that both the United States and Iran are holding talks in neutral Oman to discuss mediation between Riyadh and Tehran. Iranian media have reported that Iran's foreign minister held talks in Oman on Tuesday about ending the conflict in Yemen. Oman, which has good relations with Iran, is the only one of the six Gulf Arab states that has not joined the coalition air strikes against its western neighbour. A Houthi delegation was also reported to be in Oman on Thursday. The rebel-controlled Sabanews.net quoted Houthi spokesman Mohammed Abdulsalam as saying that talks were ongoing in the sultanate to discuss the coalition "aggression on Yemen", and that there was an "exchange of views and proposals with international and regional parties". "This is taking place under the supervision of brothers in Oman," said Abdulsalam. The Saudi-led coalition has imposed a complete air and naval blockade on impoverished Yemen. According to the World Health Organization, the Yemen conflict has killed almost 2,000 people and wounded 8,000.